An Cailleach is wide awake and busy! We woke to a winter wonderland. My daughter got that excited, magical look in her eyes, and her chief goal for the day was go go outside and sled. As for myself, I knew I had to make offerings to An Cailleach and get into the trees. I had already made an offering of bread yesterday. My UPG is that the goddess loves homemade bread, and she often demands it. I thanked her for the upcoming beauty and lessons, and I prayed that she would be gentle to my family this year. Today, after making some offerings at my altar as part of my daily devotional, I brought some maple whiskey outside and poured an offering to her. I have a bowl in my garden shrine area. It was full of snow, so it felt very appropriate. I then brought offerings of birdseed, peanuts, and apple outside for the nature spirits, including something for the deer who are sacred to An Cailleach. The forest pulled me, so I let my feet carry me onto the ATV trail. There were fresh tracks, but it was delightfully quiet when I was there – quiet save for the pleasant chirp of birds seeking food and a small, gurgling creek I hadn’t known was there before. 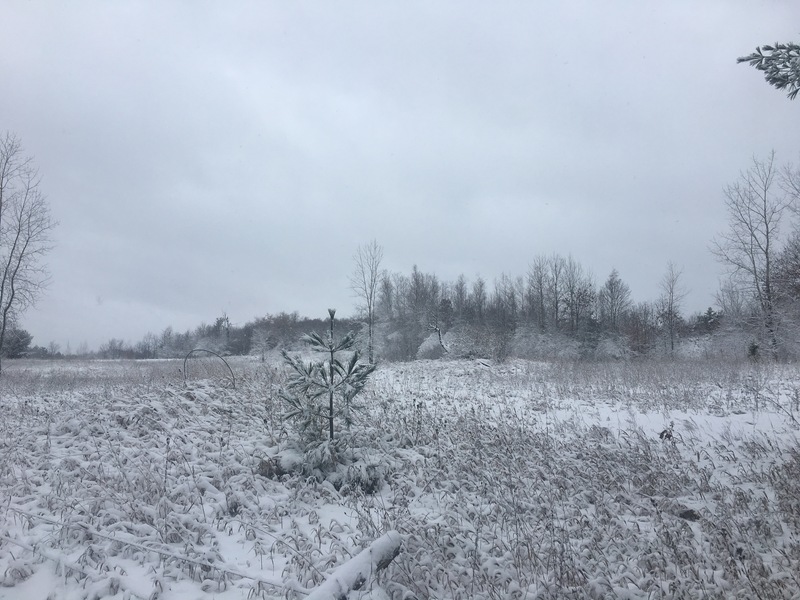 The silence of winter gives us the opportunity to explore forests in ways we can’t, or won’t, in the warmer months when they are filled with thorns, tall grass, ticks, mosquitoes, and such. I’m still getting to know the woods around my new home, and I’m glad I gave in to my wanderlust just a bit. I live for the sight of snow-powdered conifers. Photo by Grey Catsidhe, 2017. My newly finished altar, decked out for Samhain. Photo by Grey Catsidhe, 2017. I’ve been pretty quiet lately, and it’s largely because I’ve been so busy with projects. For one, I’m all about costumes. As a large part my family’s celebration involves dressing up, I put a lot of time and energy into costumes for my daughter and myself. I’ve also needed to finish editing and revising the book I had been working on for about a year. As today is November 1st, NaNoWriMo kicks off, and I’m participating! I wanted to finish the first book before beginning the sequel. It feels very appropriate to start a new spiritual year with a new writing project to feed my soul. An omen from my Ancestors spoke directly about listening to my inner call, after all. I also completed refinishing a cabinet that became my altar in our new home. I made it my goal to have it up and ready by Samhain, and it feels good to have accomplished that. It is in our kitchen, the spiritual center of the home. There are still things I want to do to improve the area. I intend to hang my tree tapestry over it, and I would like to install a small shelf or two nearby to act as shrines. But having it up, painted, and filled with all my tools helps me feel more settled. Our jack-o-lanterns kept away all the mischievous boogies. Photo by Grey Catsidhe, 2017. We kept our tradition of carving pumpkins. I also carved a turnip for inside and outside our home. I brought one up to the border between us and the cemetery, but I waited until sunrise Samhain morning. Last night, after my sleepy trick-or-treater fell asleep, I went outside to peek at the land under the light of the moon. I could just barely make out the headstones, but something kept me from going up there. They wanted their space, it seemed. 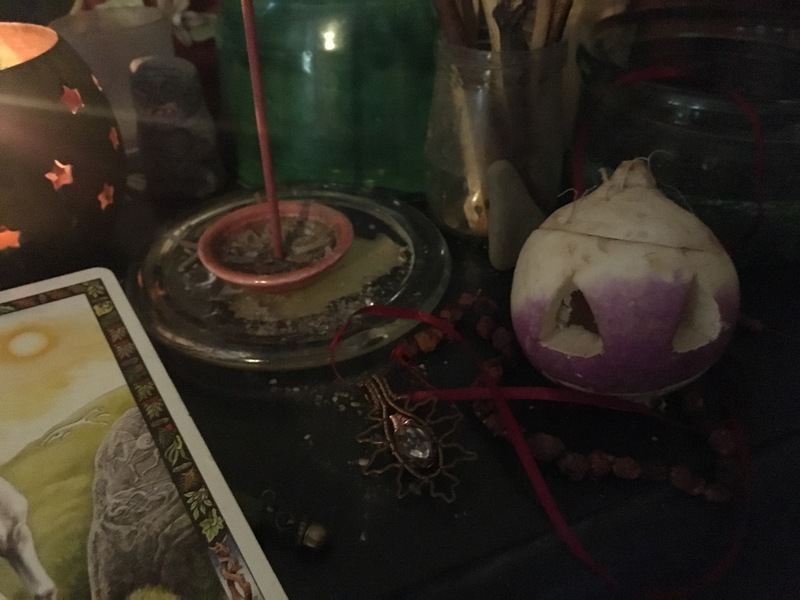 When I placed the turnip at the border, I made sure to also bring offerings of drink and apple for the dead who wish us no ill. I still need to go for a walk in the cemetery itself. Set up our Ancestor shrine just in time! Photo by Grey Catsideh, 2017. Along with my main altar, I also got the Ancestor shrine sorted. I have some photos to hang, but it’s mostly the way it was at the old apartment. My daughter helped me make offerings, both last night and this morning. I made pancakes for breakfast today, and she got a little bowl for all of us to put some in. She also stood with me before the shrine to welcome the beloved dead and thank them for their continued guidance and protection. While she slept, I did divination as is traditional. It looks like a good year is in store for us. I certainly pray that comes to pass! 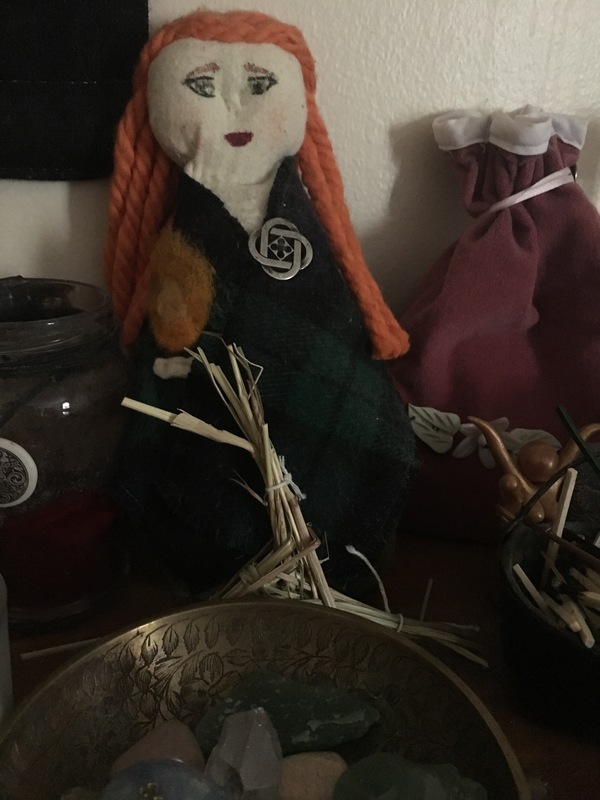 Our Samhain festivities will continue this weekend when we gather with our grove to celebrate. It’s always an emotional ritual as we call to the newly deceased. I think I should add a box of tissues to our supply box… Still, it will be cathartic. If we don’t confront death head on, life is unbalanced. Besides, we have much to celebrate, too! Our beloved dead come back to us, and we have much to learn from them. I hope my readers have a blessed Samhain as well! A mandala painted on a stone from Lake Ontario and gifted to my husband. Photo by Grey Catsidhe, 2017. For me, the Summer Solstice is a time of endings and beginnings. Vacation begins for me and many others in my field. Students go home. Several of my students moved on and I may never see or hear from them again. That was a hard pill to swallow as I had grown especially fond of some of them. We got to know each other over several years, and they were such good kids. The kind of youth that give me hope for the future. I’m so proud of them, and they taught me just as much as I taught them, I’m sure. Such is the nature of working with kids in any capacity – they grow up and we must stand back to watch them fly. “Rent” for Manannan mac Lir. Photo by Grey Catsidhe, 2017. My routine changes over the summer. I suddenly have more time and energy. While teaching is in my blood and very much a part of my Druid identity, a long vacation definitely gives me time for other things that I am equally passionate about. My family feels up to taking more walks, and we have more daylight in which to do so. We spend more time playing outside, working on the garden, and visiting beloved mountains, rivers, and lakes. I start meditating more – deeper, longer meditations that bleed over into trance states. Just thinking about it makes my heart beat with anticipation. Our Summer Solstice bonfire. Photo by Grey Catsidhe, 2017. Of course, there was, and will be, plenty of ritual involved. We had a bonfire Summer Solstice evening. It was just very casual, although I did sing as I kindled the flame. Later today, I’ll gather with my grove for a larger, more formal celebration. We’re once more honoring Manannan mac Lir and thanking him for the blessings of water. The summer brings more opportunities for gathering with like-minded people to laugh, sing, and dance around fires. Last night marked the New Moon. 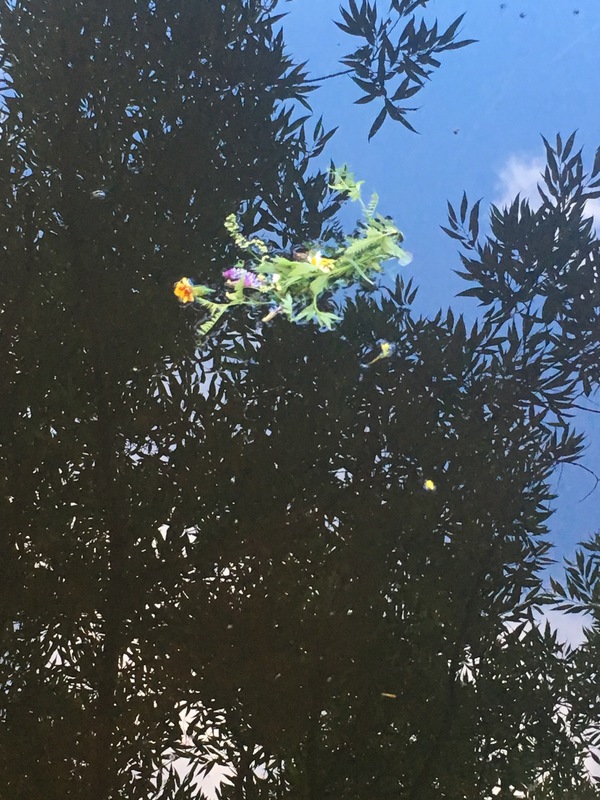 The omens for the day focused on change and, later, working with my own wildness to make me and my community a better person. I was struggling with some confidence issues earlier in the day. In transitioning from work-me to free-time me, and in the stress of all I had to accomplish to pass that threshold, I got a little goofy acting and put my foot in my mouth. I regretted it later, feeling foolish. I often worry how others see me. I spent a lot of time reflecting on what that means, how I want to be seen, and how to be true to myself. I did some midnight magical work in the garden to help me grow as a person.